Gili bewangn, hell or paradise? 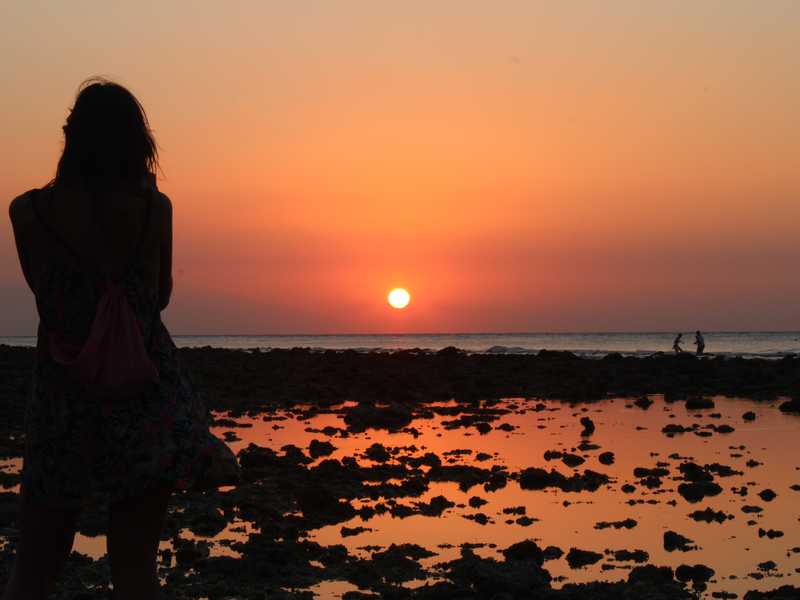 Is it worth visiting the Gili islands? In Ubud (Bali) is very well, but after almost a week living among rice paddies we entered the bug of the beach and decided to move to the Gili islands. 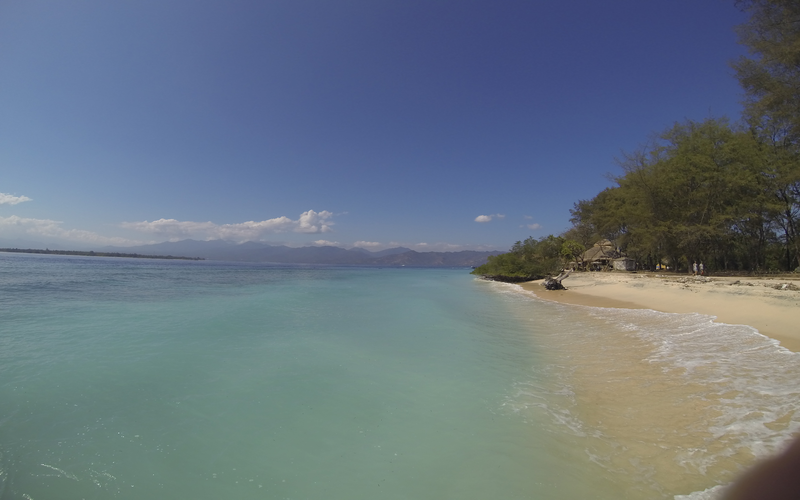 These three small islets of Lombok were what we needed to spend a few days on the beach, scuba diving and snorkeling. There Were opinions of all kinds on these islands. Many hated them, claiming that the beaches were plagued with dead coral and that they were not pretty, while others worshipped them. We Decided to try and decide for ourselves. Also the desire of beach that we had were many! Nor Did We plan to match the beaches of Thailand (or Galicia). The Gilis couldn't disappoint us. To arrive, we hired a fast-boat with the company Wahana that cost us 1.5 million Rp (about €90) for two people. This ticket included the transfer from Ubud to the port of Padangbai and the port of Padangbai back to Seminyak, our next stopover on our journey through Indonesia. If you want to save yourself a few eurillos, you can go by yourself to the port of Padangbai or Benoa in Bali and take the public ferry to Lombok. It Takes more or less twice as fast-boat (between 4 and 5 hours) but costs much less. 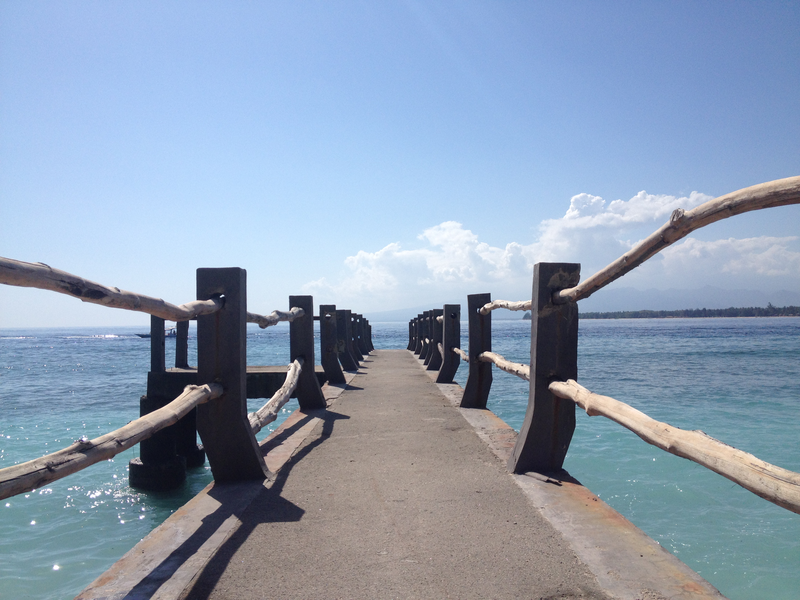 Yes, once in Lombok you will have to take another public boat to get to the Gilis. The option of the public ferry is fine if your trip is long lasting and you don't mind losing a day on transfers. We on the contrary decided to hire the fast-boat to be able to take advantage of our days in Indonesia to the maximum. In Indonesia The concept of punctuality is not very entrenched, it always goes backwards. We Were picked up later than the scheduled time, and our boat came out of Padangbai too late. The Boat of Wahana was fast, but also very uncomfortable: a sad fan in a corner of the boat did not refresh anyone, facilitating our cooking to the Bain-Marie in its narrow seats of leather. At the same time, the boat would not stop to give boats on the waves (a dramamine would not have come at all bad) and the salt water of the Bali Sea entered through the windows. A show. We Chose to look for accommodation in MAWANGN because it is the largest and most developed of the three Gilis, and in the middle of high season (July and August) we did not know if in the other two islands we would find accommodation available. As we arrived, we proceeded to look for some room to spend our next days. As I told you in another post, we found our site in Rumah Kalua. We Left our backpacks in our huge room and proceeded to explore the island. Menudo disappointment! We walked south and suddenly, there was loud music everywhere, English drinking cubatas on the street… Wait a minute, am I in Gili T or Magaluf? When We got past this marabunta, the beach we found was ugly, full of coral, and the bathroom was impossible. The farther south, the more deserted and discouraging the island was. We Don't even take pictures. We went to eat and we asked to change the ticket to return to Bali the next day. Or Lombok, which we had seen from the ship and looked very good. 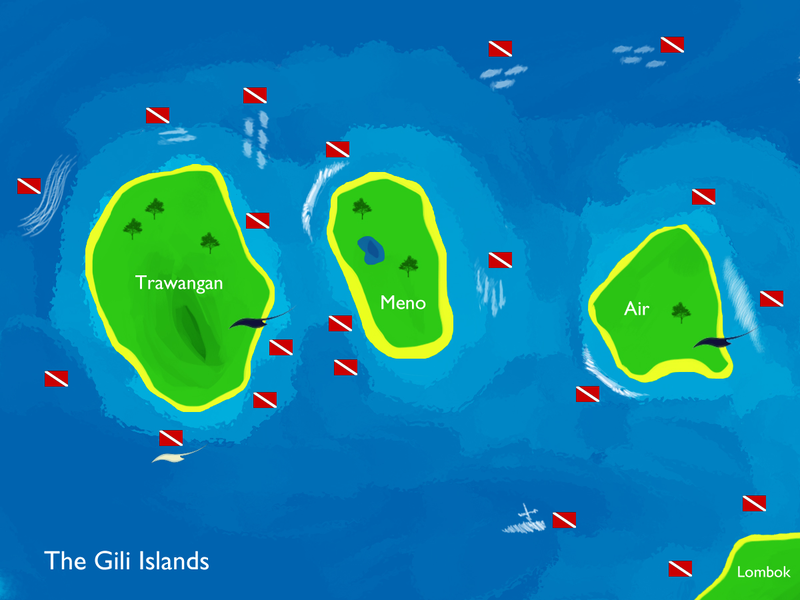 We Also thought we'd go to Gili Meno. We Went Back to the hotel and started reading the guide and checking on the Internet. Apparently we should have headed north! So we left our room and went north with our last hopes. 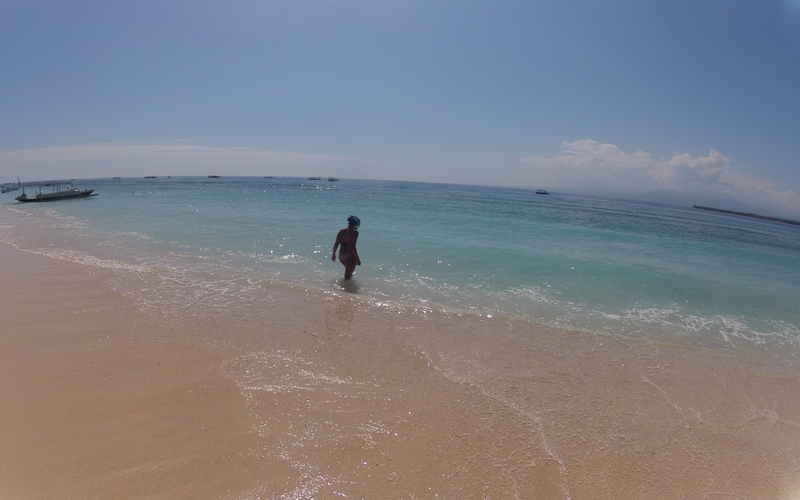 And Indeed, north of Gili T there is a sandy beach, where you can snorkel among a lot of fish. As It was at night, we decided to go further north still to see the sunset, and on the Way back, we dined in a place with gazebos in the sand in front of the sea which was all tranquility. At The End Gili T was not so bad! This became our routine throughout our stay in the Gili islands: every day we saw how the sun was put north of Gili T with Bali background (perfectly distinguishes the silhouette of Gunung Agung and even the Batur volcano) and let us caress by the Bris To Marina with a few Bintangs in these gazebos. 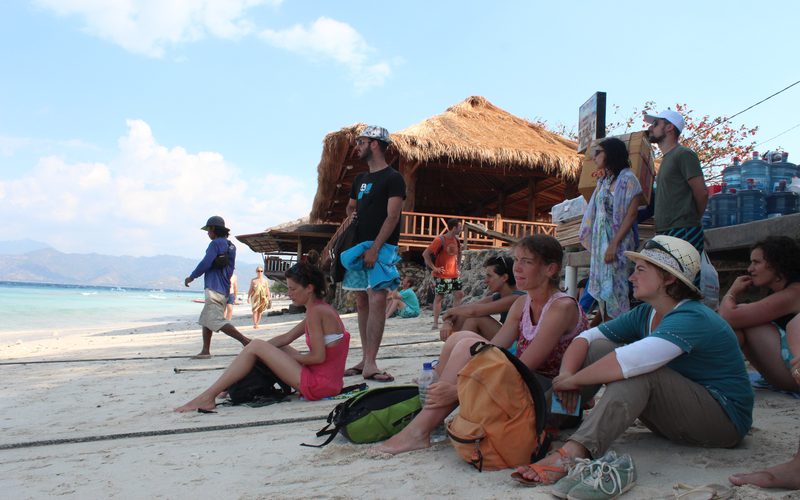 The next day Our plan was to spend the day at Gili Meno, but we were late for the public boat! As we didn't want to stay on Gili T all day or pay the exaggerated price of a private boat, we decided to take one of the boats that do the snorkeling tour that takes you to the best enclaves of the three islands. There Are plenty of places to offer this tour: it lasts about 5 hours, all cost about 100,000 Rp (€6) and sometimes include food in Gili Air. The bottom of the boat is glass so you can see the transparent seabed while you sail. 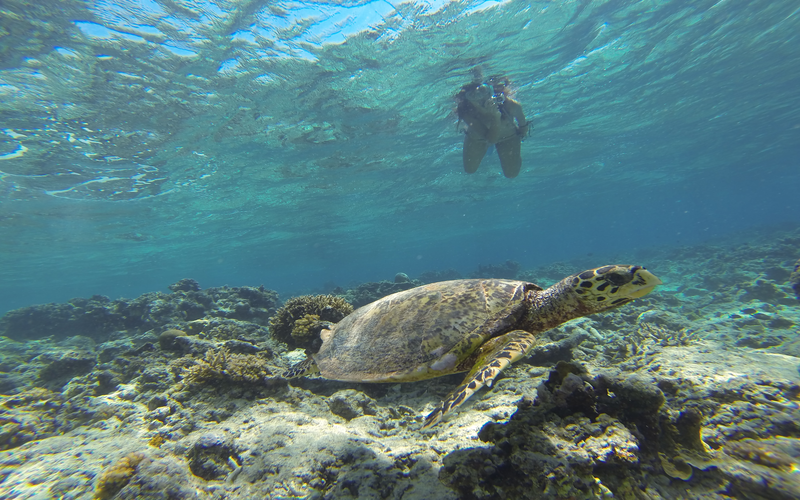 In This tour we visited a wreck, we found turtles, sea snakes and a lot of fish. The next day we did manage to take the public boat to go to Gili Meno. There are Only two hours: one in the morning about 9 a. m and another in the afternoon around 15 p.m. Sometimes it can give a little bit of fear, as the swell is very strong, you just get soaked and it looks like you're going to end up under a wave. By the way, they don't usually check if you bought the ticket or not, but we were legal and we bought it always. The smallest of the Gilis we fell in love so much that we returned the rest of the days. The beaches of Meno are deserted and an absolute calm reigns. Our Place in Main was Ana's Warung and Bungalows, where we ate every day in their gazebos in front of the sea. Also there we rented the fins and we kept our things safe. They had No room availability, if we hadn't moved into their facilities (in fact if we ever go back to the Gilis, we will stay here). The best Thing is that it is located right in front of the Turtle house! 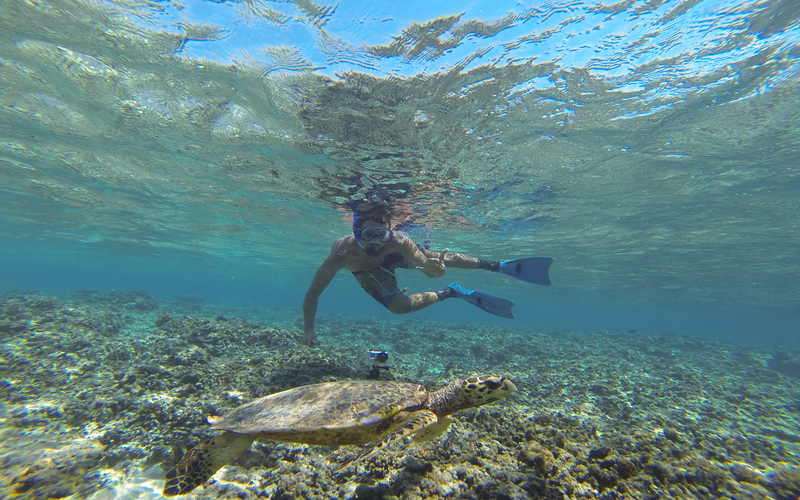 You Just have to swim a little, pass the Barrier Reef and you will find a lot of turtles to accompany. You Can feel what it is to swim with a turtle through the video that I recorded. You can Also peek into the abyss of coral if you swim to where the boats are: there is a descent of 100-200 meters! Impresses. As A responsible blogger with animals, I must remind you first of all that you should not touch the coral, not only because you can hurt, but because you would be destroying part of an ecosystem. He Thinks you're a guest: that little piece of sea belongs to the turtles, not you. 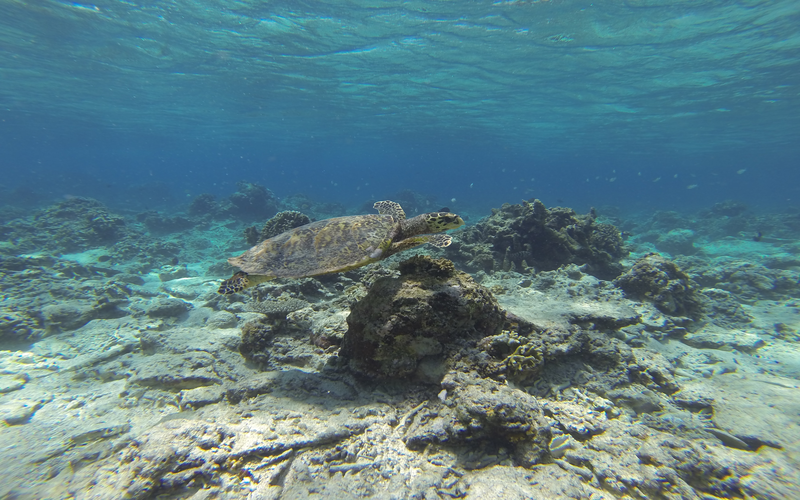 If you find a turtle but you see that it is frightened, escaping from you or even hiding in the coral, leave it. There will be another one that enjoys more of your company and of the cameras, I assure you. And Please, the most important thing is not to touch the Turtles! They Are Scary and your "photo moment" with it goes to molar equal even if you do not touch it. You See how the photos are cool even if you do not touch the turtles? 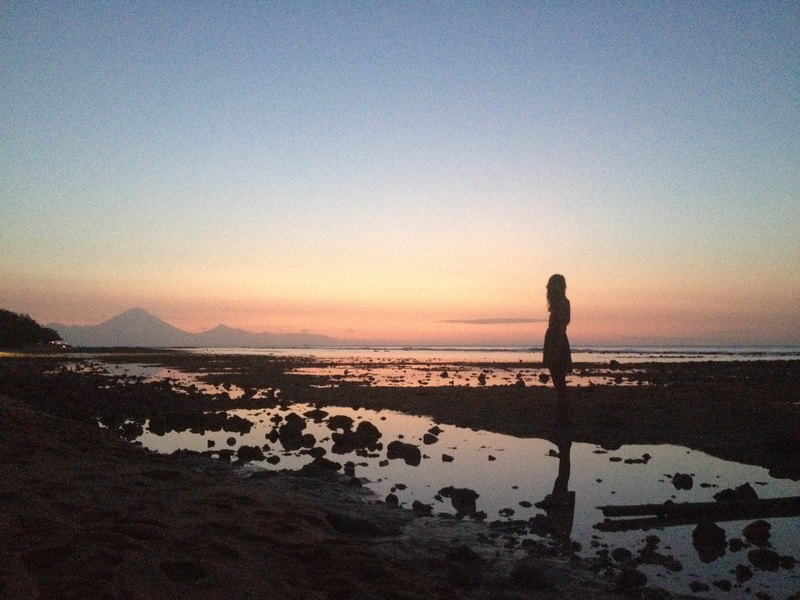 In conclusion I can say that despite our fatal first moment, the Gili islands did like me, especially the quiet northern part of Gili T with its precious sunsets with Bali background. Gili Meno and his turtles is not that I gustasen, I think I even fell in love a little. It Is Perfect for those whose ideal vacation plan is snorkeling, snorkeling, being quiet on almost deserted beaches and drinking beer every night. It Doesn't Sound Bad, Does it? If you are in Bali or Lombok, try to make a getaway. You have nothing to lose!